RICHMOND, VA (October 6, 2015) – The Elite Clubs National League (ECNL) today announced Laura Liedle, Cailee Dennis and Stefani Doyle as the September S’Hero of the Month award recipients for individual and community leadership. As part of the Amazing Young WomenTM movement, S’Heroes highlights female role models and is creating an aspirational line-up of women whose stories motivate and inspire our nation’s young female athletes (H.E.R), who are balancing their ambition to become elite athletes with the pressures of fitting in with social peers. Each month the ECNL selects new S’Heroes whose stories of personal struggle and pinnacle moments will help ignite Her fire to overcome the challenges faced in becoming the next generation of leaders. By celebrating these role models, the ECNL will connect young women with other amazing young women and galvanize a community of girls connected by how their challenges fuel their fire. Laura Liedle is an ECNL Alum (’12), and currently a senior at Stanford University where she is an important member of the back line for the women’s soccer team. In her collegiate career thus far, she has started and played in every game, earning several accolades. Liedle has been a Pac-12 All-Academic honorable mention for the last two years, and last season was an All Pac-12 honorable mention. “Playing soccer at Stanford has really given me the opportunity to impact and inspire others, which is my life goal.” said Liedle. In addition to her successful soccer career, she volunteers with two organizations several times a week during the offseason, Stanford GOALs and Bay Area Women’s Sports Initiative (BAWSI). As a collegiate athlete, Stanford student and volunteer, Liedle seems to do it all. She attributes this to lack of sleep and writing everything down in her planner. Balancing all of her duties isn’t easy, however Liedle embraces the opportunity because she is doing what she loves. While volunteering her time with Stanford GOALs, Liedle coaches children in soccer after school as part of the family-based treatment of obesity for low-income Latino and African-American children and their families. The seven-year community based research program gives a hands-on approach to improve overall health of enrolled families. Liedle is majoring in human biology and does research in the Ashley Lab, which focuses on application of genomics to medicine and leads the Stanford Center for Inherited Cardiovascular Disease. She also gets to study the DNA of elite athletes to try and characterize determinants of human performance. In her soccer career, Liedle was part of the 2011 ECNL National Championship with the San Diego Surf ECNL U17 team, and has made two appearances in the NCAA College Cup during her soccer career at Stanford. Liedle is a candidate for the Lowe’s Senior CLASS award. In order to be eligible, a student-athlete must be classified as an NCAA Division I senior and have notable achievements in four areas of excellence: community, classroom, character and competition. CLASS is an acronym for Celebrating Loyalty and Achievement for Staying in School ®. The Senior CLASS Award focuses on the total student-athlete and encourages students to use their platform in athletics to make a positive impact as leaders in their communities. “Laura is an incredible person and has a phenomenal work-ethic. She leads by example and is highly respected by her teammates,”said Stanford Head Coach Paul Ratcliffe. Laura is an ambitious young woman with the desire to leave her mark and be a part of a movement to change young lives. Her need to inspire others and devotion to spend time with those in need illustrates what it means to be an Amazing Young Woman. To learn more about Stanford GOALS click here, Bay Area Women’s Sports Initiative click here. Both Cailee Dennis and Stefani Doyle’s (Dallas Sting ECNL U18) competitive drive on the field has transcended into an entrepreneurial spirit off the field. As Co-Founders of The Cancer Garage Sale in 2011, the girls have spearheaded efforts in their Dallas community to raise money for the American Cancer Society (ACS) and have raised more than $75,000 for the cause. They have been recognized both regionally and nationally by the ACS for their fundraising efforts. Dennis and Doyle are members of the Dallas Sting ECNL U18 team, and have been with the club since they were 12 years old. They will continue their soccer careers together at the University of Arkansas in the fall of 2016. The girls manage to balance the enormous fundraiser with school and soccer, running straight to the sale in their training uniforms more often than not. The Cancer Garage Sale started out as a small garage sale in 2011, where Dennis, Doyle and another childhood friend sold used and donated items to raise money for the American Cancer Society. Over the last five years, it has expanded into a full operation. The single garage has grown to an “exhibition” hall of sorts with an active Facebook page, and Baylor Medical Center has donated office space for the girls to continue and expand their efforts. Dennis and Doyle live on the same street and have been friends since second grade when they were “locker buddies” in school. But what made the girls grow closer and drives them is their personal connection to the cause. They both have had a parent diagnosed with cancer. Doyle’s mom, Sh’Rae, was diagnosed in February 2012 with a rare form of lung cancer that took her life later that year. Dennis’s mom, Danielle, was diagnosed a year later and is a stage three ovarian cancer survivor. They recently had a sale August 20-23, where they managed to raise $22,000. They will be holding more sales as the year continues, with their goal to raise $33,000 before year-end. The 2015 “close-out sale” takes places October 22-24, 2015 and includes 32 rooms of donated items. The Cancer Garage Sale has all types of items donated, from used items to brand new items that still have the tags. Everything from clothing, to picture frames, to dining room tables and wedding dresses, to treadmills come together on display in their show room. Many of the Dallas Sting players, and teammates of Dennis and Doyle, help work the sales to join the movement. “They are definitely young women that you want to emulate. They have both survived adversity, and soccer has been a big part of their life,” said Dallas Sting team manager and longtime family friend to Dennis and Doyle, Ana Katherine Curry. Thank you Cailee and Stefani for all of your hard work both on and off the field. You both are truly #AmazingYoungWomen. Good luck next year as you continue your soccer career at the University of Arkansas. 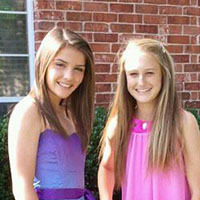 To learn more about Cailee and Stefani’s efforts, click here. Studies have shown that driving factors behind girls dropping out of sports include social stigma and limited exposure to the inspirational journeys trailblazed by positive role models. Too often player traits that are so valued by teams are not promoted as “beautiful” traits for young girls. By age 14, girls are dropping out of sports at two times the rate of boys. Amazing Young Women encourages young female athletes to embrace their ambitious, driven and competitive nature. And those recognized as S’Heroes have taken a spirit of leadership and inspiration from the field, and have demonstrated that it’s not just about a phase of your life, but a way of life. About Elite Clubs National League:The Elite Clubs National League (ECNL) was founded in 2009 to enhance the developmental experience of female youth soccer players in the United States through: (i) Improving the competitive environment through creation of a true national competitive league; (ii) Improving the process for identifying elite female soccer players for the U.S. Soccer youth national teams through a systematic scouting and identification program based on national competitions; and (iii) improving the daily training environment at top female youth soccer clubs through developing best practices and training and organizational guidelines for its member clubs.Â The ECNL is sanctioned by US Club Soccer and is sponsored by Nike Soccer.